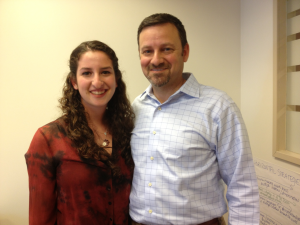 Gann Academy recently posted an article about CJP Intern and Jewish Boston Inclusion blogger Sierra Weiss. Read on to learn about Sierra’s amazing work in the community! In between college applications and dance classes, Sierra Weiss ’14 is a committed volunteer, a State House intern and President/Founder of dance4empowerment. dance4empowerment — a non-profit organization that develops dance programs for people with disabilities and funds inclusive art programs in Boston — was born through experience as a camper and counselor-in-training at Camp Ramah in New England, support from mentors and peers at Gann Academy, and a deep passion for dance and its therapeutic nature. Gann Academy was very supportive of her newfound interest. In her junior year at Gann, she participated in the Academy’s Exploration Week — a week to learn outside of the traditional classroom through planned national or local trips. Gann gave Weiss the flexibility to create her own trip, during which she traveled to Israel to learn more about the pioneer foundations available for Israeli children with disabilities. That same year, she did an Independent Research and Design (IRaD) project on the genetics of Down’s syndrome. “I was interested in learning more of the genetic background of people with disabilities, and I think that it was really amazing that Gann gave me the opportunity to further my studies and understanding of the students I was working with,” she says. A dancer at Joanne Langione Dance Center in Newton since seventh grade, Weiss decided the best way to empower her Tikvah campers was through a dance program. “Because dance is such a therapeutic time for me, giving me time to reflect on my week, express myself, have fun, and make new connections I wanted to bring dance to Ramah,” she says. As a counselor-in-training, she organized for a dance therapist to spend two days teaching a therapy program to the campers. The dance therapist cancelled last minute. “I think it may have turned out for the better,” she says. The change of plans allowed her to work with a dance instructor at Camp Ramah and teach the Tikvah campers a dance to be performed in front of the entire camp. After her first successful program at Camp Ramah and her experiential learning through Gann, Weiss says she met with several mentors, cemented her idea and goals, and decided to incorporate as a non-profit. Today, dance4empowerment is a vision that supports existing programs, like the Tikvah program and Gateways Access to Jewish Life in Newton. At Gateways, a Sunday school program for individuals with disabilities, she volunteers weekly, leading movement programs in a ten-student classroom. She hopes to soon double the size of the Gateways program and expand into a second ten-student classroom. For more information about Sierra’s work, you can visit her blog, follow her on Twitter and check out her website! Come Join in a Special Inclusion Shabbat for Jewish Disability Awareness Month!